From left, Commissioner Ed Humphrey, State Sen. Joe Uecker, Brown County Commissioner Daryll Gray, and Commissioner David Painter. 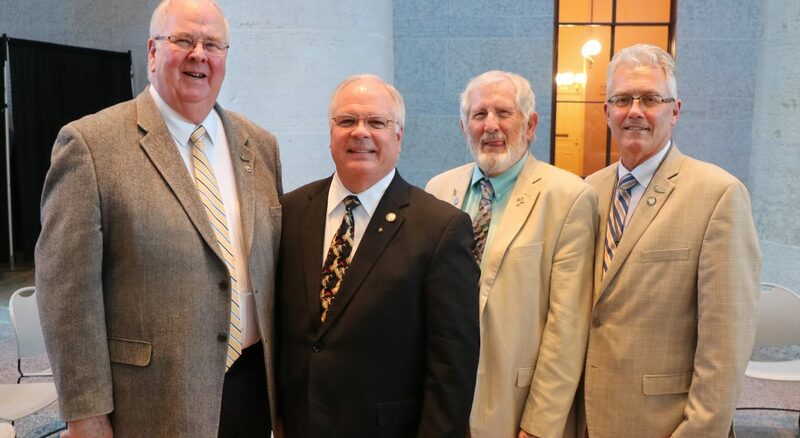 COLUMBUS, Ohio (April 15, 2019) – Clermont County Commissioners David Painter and Ed Humphrey, along with County Treasurer Jeannie Zurmehly and Common Pleas Judge Jerry McBride attended the 2019 Ohio Council of County Officials (OCCO) Legislative Reception on April 9 to meet with state legislators and help build a stronger partnership between state and county government. An important topic of discussion was support for budget amendment HC0607 to fully fund indigent defense reimbursement. State Sen. Joe Uecker, whose district includes Clermont County, was among the state legislators attending. State Reps. John Becker and Doug Green, both of whom represent Clermont County, are co-sponsors of the bill. County leaders had the opportunity to meet with Gov. Mike DeWine and Lt. Gov. Jon Husted as well as their legislators to discuss issues affecting counties, including budget amendment HC0607. Gov. DeWine’s proposed budget commits an additional $60 million each year in general revenue funds for indigent defense, providing for a reimbursement rate of approximately 80 percent. While CCAO greatly appreciates DeWine’s proposed substantial investment, CCAO is encouraging legislators to support HC0607 to provide 100 percent reimbursement. In 2018, a total of $2.02 million was spent on indigent defense in Clermont County. Of that, the county funded almost $1.2 million and the state funded the balance.